Place the meter readings from the house on the Zone Scale according to your previsualization (Figure 65). Remember that one of the primary objectives of this test is to determine your Normal Development Time. For this reason, it is very important that your placements be logical and that all the values fit properly on the scale. For example, a common mistake would be to place the meter reading for the very dark part of the subject on Zone III instead of Zone II. This would result in a print that looks one stop lighter in the shadow areas than you would expect. Zone III is the appropriate zone for well-lit, fully textured, dark subject areas such as green foliage and brown wooden doors. Also, if the contrast of your test subject is too flat or too contrasty — in other words, if the Important Highlight Area falls on Zone VI or VIII instead of Zone VII — find a better house. FIGURE 65 Step 3 - Sketch and Exposure Record with placements. Note: Don't be surprised if all your meter readings don't fit as perfectly on your Zone Scale as they do on my ideal illustration. 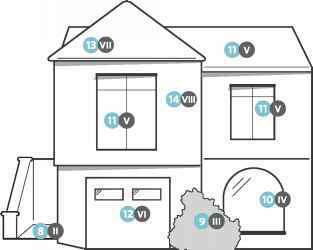 If, for example, after placing your Important Shadow Area on Zone III, the area that you wanted to be Zone VI falls on Zone VI 1/2, simply record this on the Exposure Record and take this into consideration when you evaluate your final test print. What is important is that you have clearly visible areas of Zones II, III, and VII.